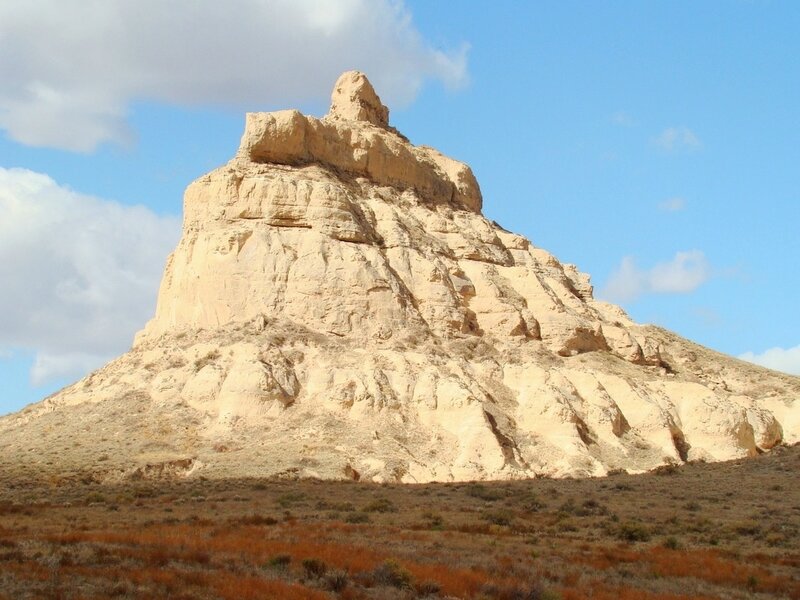 ﻿﻿Courthouse Rock﻿ ﻿is a butte that is structured somewhat like a tiered cake, with a series of ascending short cliffs roughly 200 feet to the summit. 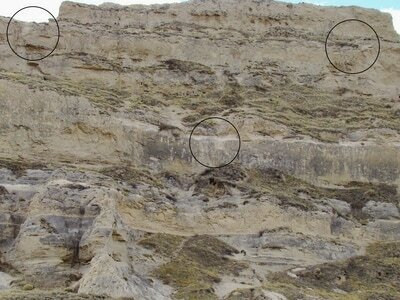 Depending on one's criteria, there would be at least 5 and maybe 6 "layers" or levels of cliffs. 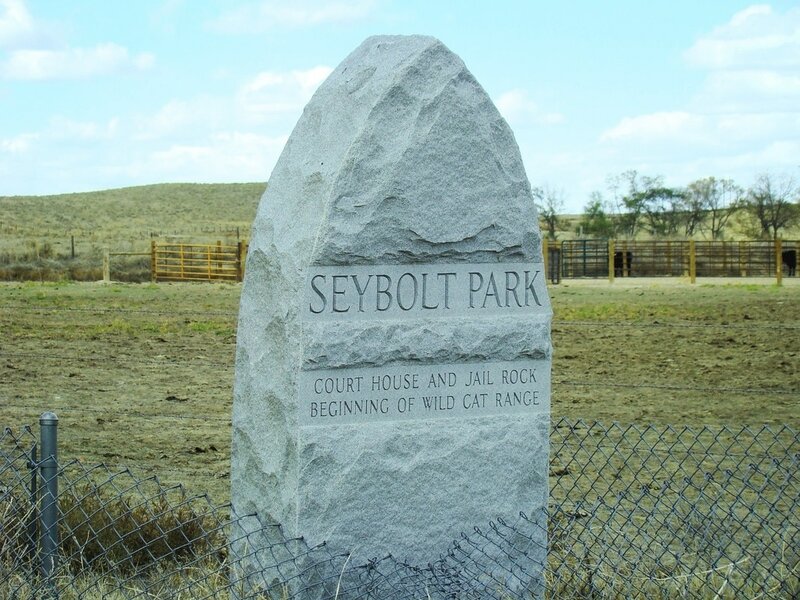 Since the days of the wagon trains on the old Oregon Trail, people have been scrambling to the summit, via the north-northeast slopes, and sometimes carving their names or initials along the way. Erosion of the hard-packed clay sides has worn the key access points to the place that it now requires Class 4 scrambling skills to reach the summit. Perhaps someday those access points will be improved. Until then, novice climbers should be ready to turn back if the requirements of the ascent exceeds their skills and endangers their safety. Among the photos in the gallery below, is a north-northeast side view that has the three most difficult access points circled. Fortunately, a climber only has to choose one of the two on the second-from-top tier or cliff. The eastern one of these goes up from a rock shelf that looks like it partially broke off at some point in years past, leaving climbers with a risky reach to the well-worn foot and hand-holds. Because of the soft nature of the "rock" in the shelf, the potential for further breakage has to exist. The access point further west is also worn, but has some slope that works in the favor of the climber, especially if the foot and hand holds could be restored there... There are also some difficult access points toward the lower east end of the northern slope. 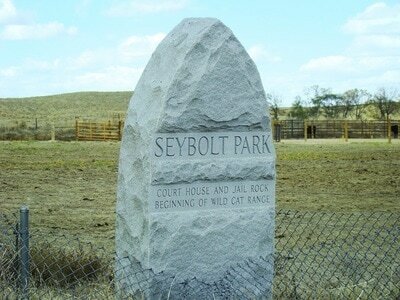 They were undoubtedly much more user-friendly when they were first carved. 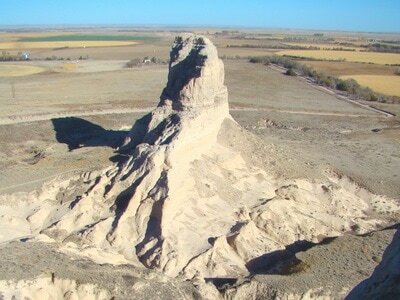 But erosion has made them kind of difficult to use. Courthouse Rock certainly provides a challenging, but fun climb. 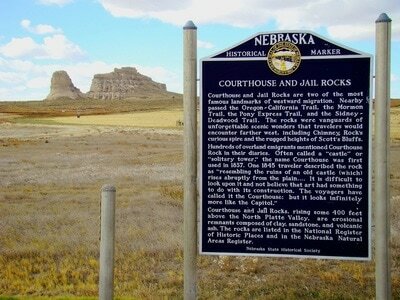 Jail Rock may well be the most difficult summit to reach on publicly-accessible lands in Nebraska. It is not as high as its close neighbor, Courthouse Rock, but certainly much more difficult to climb. 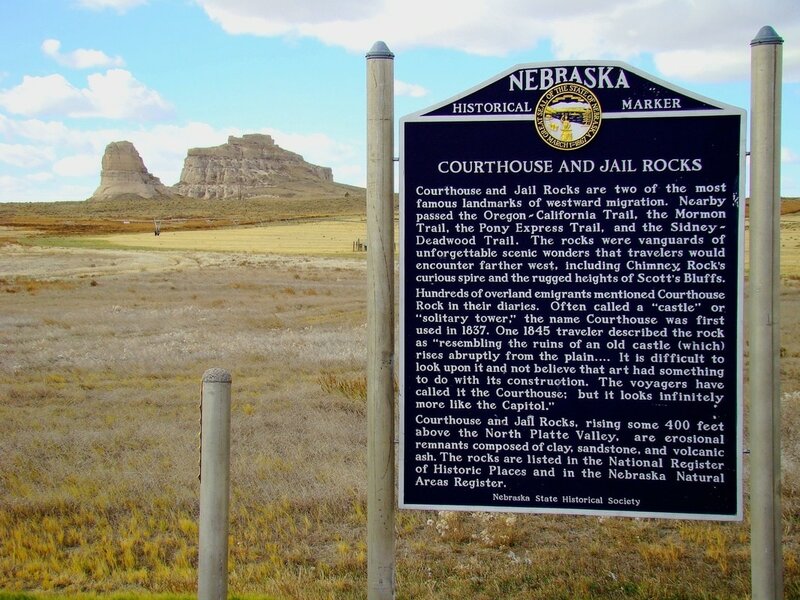 In fact, Jail Rock is not the steepest or highest summit in the state, but its limited supply of climber-friendly characteristics would make it very unattainable to all the most skillful climbers in the country. Remarkably, there have been reports of climbers being seen at the summit. But, until a reputable climber is willing to make a report of an ascent, it remains a mystery. Perhaps the north side, with all its crevices and potential anchor points, might provide the route for the best chance of a successful ascent to the summit. 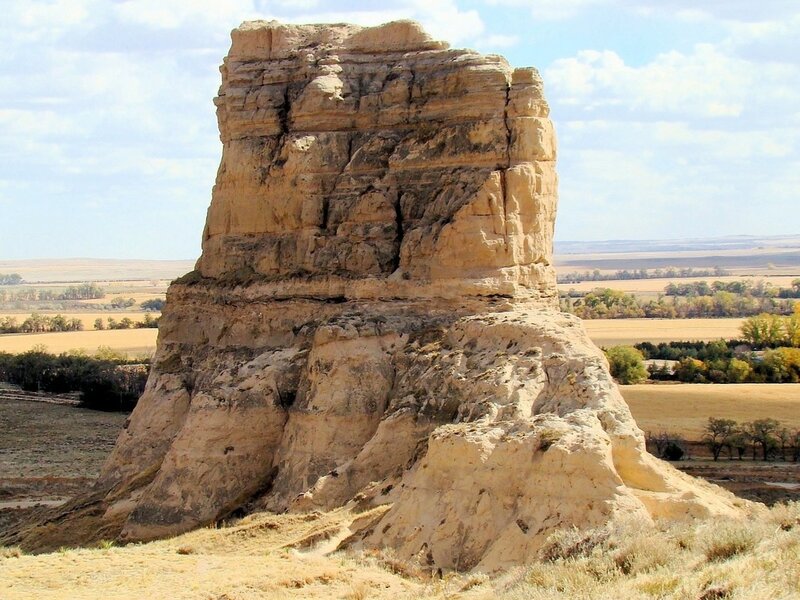 We would love to hear from someone who has made the climb all the way to the apex of Jail Rock.